Stockholm Old Town, Sweden - the old city within the city - from 1600s. 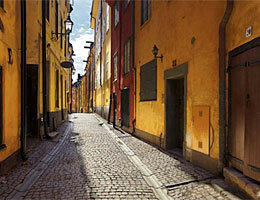 Today, the Old Town is the old part of Stockholm with its stunning buildings and narrow alleyways kept. 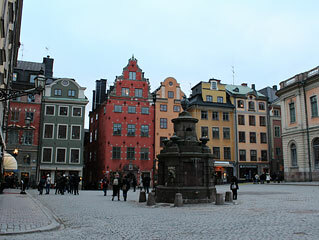 But when Stockholm was founded in the 1200s the Old Town was actually the city's location. The city was built next to the castle which is now the Royal Palace. Outside the city was then countryside where today's Stockholm is situated. Stockholm was founded in the 1200s, and the city was built next to the castle. Because the town was placed on an island they also built city walls all around. In here the daily life went on among the city's inhabitants. Fires were common in these days cities and many of the houses were built of wood. September 1, 1625 a fire broke out in the Old Town, which spread rapidly. After the fire it was decided that the city's houses should be built of stone. Even today, these beautiful buildings in their different colors are preserved and the narrow alleys can almost make you imagine life here when there was no electricity and no cars. The Main Square (Stortorget) in the Old Town was the heart of the city, here you would find the Town Hall and also Sweden's first pharmacy (opened in 1575) and one of the city's wells were here - the so called Stortorgsbrunnen. Today it´s back in place on the Square but are not functioning. On the square were also held farmers' markets but it was also the place of pain and death. 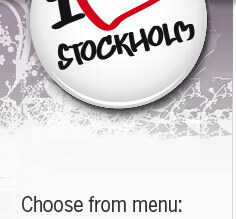 The most famous is the Stockholm Bloodbath that took place in November 1520 when several people were executed here. In time, the Old Town became the Stockholm slum and when the city was modernized, people thought that it was time to clean up the old town and start tearing down houses. Already in the 1840s there was talk of demolition of the entire area. Luckily nothing happened and in 1900 they began to understand the Old Town historic value. Perhaps we have the artist Carl Larsson to thank for that it is preserved. Carl himself was born in the Old Town and in 1904 he made a statement that if he were a millionaire, he would buy all the houses and restore them and put in modern amenities. During the 1930s, major renovations of the Old Town began, and since 1980 the district is protected by a government decision. Take a walk in the Stockholm's original city center and you walk on the cobblestones in the narrow alleys of the Old Town. The guide tells stories about the city, including the legend of St. Göran and the Dragon and, of course, Stockholm's bloodbath. Departs from: Gustav Adolfs Torg, 1,30 PM guide in English and German. Köpmangatan is the Old Town and Stockholm's oldest street. It is already mentioned in 1323. Skomakargatan was added in 1337. Both of these streets streches out from the Main Square (Stortorget), the city's past city center. The city's main streets were Västerlånggatan and Österlånggatan which is mentioned in the 1400s. Today Västerlånggatan "the tourist street" is filled with small shops, cafes and restaurants. Österlånggatan is a bit calmer, here you will find the famous restaurant Den Gyldene Freden, from 1722. Mårten Trotzig alley is Stockholm's narrowest alley, only 90 cm wide. The name is from 1949 after a German merchant named Mårten Trotzig who bought properties around the alley. Previously, it has had other names ex. the tronge Trappe grenden. Brända tomten (The burned place) is a small place on the corner Kindstugatan and Själagårdsgatan. When the house burned down in 1728 there was never built any new house here and now it is a small place with a nice chestnut tree. In Old Town there are several neighborhoods named after gods primarily from Greek and Roman mythology. Most added during the 1600s. Here you'll find neighborhoods such as: Achilles block, Apollo quarters, Europe quarters and Hercules block. 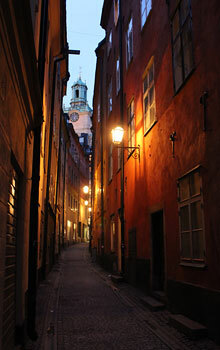 Go with a guide through the narrow streets of Old Town Stockholm (in swedish called Gamla Stan). Many spooky things have happend here during the years that have passed. Do you dare to go with? 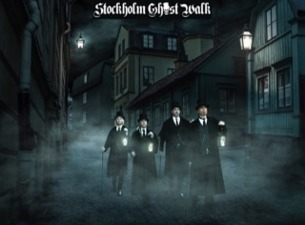 This is the official Ghost Walk in Stockholm. On the red house on the Main Square (Stortorget), one can see several white stones on the facade. They should be 92 . They represent the number executed during the Stockholm Bloodbath in 1520. It is said that as long as these white stones remain in the facade the executed will have their peace but if a stone is lost then the person that the stone represented will no longer have peace and will become a ghost that will walk the city streets in eternity. 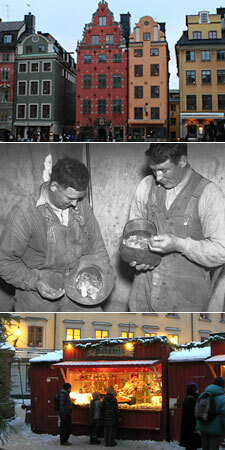 1937 a large silver treasure were found in a shop at Lilla Nygatan 5 when a renovation was in progress. The treasure consisted of among other 18,000 silver coins from the mid 1600s to 1741. The coins can be seen in the Coin Cabinet. A Christmas tradition is to have a Christmas market on the Main Square in the Old Town. Since 1915 it is organized by the Stockholm Gillet. We really enjoyed to wander among the stands when we were here in December 2010.